Remember Sensei Sethi, the man who taught me Aikido? No? Doesn’t ring a bell? Let me jog your memory a bit. About a decade ago, while strolling through a park in south Delhi, I happened to see a portly figure engaging in a graceful dance-like tussle with two others. Their moves were elegant and one might even say gentle, and yet the martial quality of their actions was undeniable. Eventually, the burly gent whirled around and held his opponent’s arms, wrenching them with a degree of controlled fury that ended with his opponents writhing on the ground, their faces a twisted mask of agony and appreciation. I went up to the group while it was engaged in the process of finding its feet again and asked what they were doing. I had read a bit about Tai Chi Chuan at the time though I hadn’t seen much of it. But the graceful expression of power in the master’s moves reminded me of the internal power that surreptitiously courses through the limbs of a true Tai Chi practitioner. “No, this isn’t Tai Chi. We are practicing Aikido, a Japanese martial art that is as gentle as it is firm. However, Aikido draws influences from Baguazhang, an internal Chinese martial art, much like Tai Chi”, said the master. He wasnt a very big man. About 5’8″, but heavily built, and from a distance, with his heavy paunch and chubby arms, looked decidedly fat, but on closer inspection, all that chubbiness had this unshakeable dense quality about, much like a sumo wrestler’s, but on a far smaller scale. Since they were all wearing a ‘gi’, I should have realized that the art had Japanese origins. The master also wore a black skirt like wrap-around called a hakama. Only black-belts were allowed the wear them, I was told. But let’s not linger here for too long. After that intriguing introduction, I signed up for a few classes and was drawn to the art’s philosophy – created in the wake of World War II in a Japan that stood shamed, bruised and battered. Though potentially lethal, the techniques however allowed a practitioner to control the degree of punishment meted out to one’s opponent. Minimum force, maximum compassion seemed to be the aikidoka’s credo, which makes this art unique in the reasonably violent world of self-defense with its flying kicks and hammer punches. 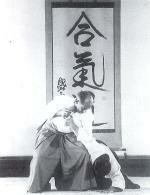 One of the most interesting aspects of aikido is ‘ki’ training. A rough translation of the word ki would be ‘universal energy’. Aikidokas do a lot of breathwork at the end of every training session to try and align with the universal force and try and harness this energy and channel it though their bodies. They said he dodged a hail of bullets from border guards in Mongolia because he could see the trajectory of the bullets even as they were fired. Morihei’s miracles inspired my early practice but I guess I needed tangible evidence of this ki force. I guess I had been pestering my teacher for a while. So on a balmy summer evening, Sensei Sethi decided that it was time for his students to sample the incredible force of ki. By now, the class had shifted from the park to a gymnasium where we shared the floor with a muay thai group. We had finished our class and were wrapping up the evening with some ‘kokyoho’ – ki breath work, a bit like pranayama. The muay thai students were also done with their sparring and were sitting around their ‘ring’ and rolling glass bottles filled with sand all along their shins to toughen skin and bone so it could both deliver and take punishment. Sensei declared that he would demonstrate the difference between muscular strength and the strength of the universal life force but for that we would need to test our muscular strength first. We arm wrestled each other to settle who was the strongest amongst us. My modest arms didn’t take me very far from the middle of the pack but who won the mini-tournament was the son of a local weight-lifting federation president and had been schooled well on the nuances of the iron game. The guy who came in second best was big and muscular and had beaten a hall full of well conditioned kickboxers and aikidokas but this beast beat his knuckles to pulp within mere seconds. After the champ had rested, Sensei said that Aikido’s code of honour forbade him from trying to beat a competitor in a test of strength but he would hold us in the neutral position for as long as we wanted. Anybody who has engaged in an arm-wrestling match would know that it is far tougher for an athlete to control the flow of strength and momentum and hold the neutral position against an opponent than it is to try and beat him. But one by one, we all pulled and pushed and wrestled and struggled but we couldn’t move his arm an inch. Nay, not even the beast. While we gasped with awe and congratulated Sensei, he just nodded and without a trace of emotion, sat down in ‘seiza’ – on his knees and haunches, much like vajrasana. He extended his arms and asked three people to grab his right arm and three others to grab his left. He instructed us to push and pull as much as we could till he was thrown to the ground. We knew what we had already witnessed was pretty special but just in case he was just way too strong physically than the rest of us, this test, should Sensei succeed should put our doubts to rest. Sensei had also announced that if he was truly using ki, even after we have all failed to dislodge him, he would still be breathing at a slow and easy pace and wouldn’t even have broken a sweat. We got into a huddle and agreed to push and pull with all our might. The six of us heaved and hauled, pulled and pushed but all to no avail. We couldn’t move the man an inch. We were huffing and puffing and sweating buckets while Sensei just smiled beatifically. Then Sensei waved his arms, almost unmindful of the weight of three grown men on each arm, folded them and then extended them with a fair degree of force. Like ants on a branch swaying in a storm, we were flung one way and the other. Like cows caught in a tornado, we felt this force literally lift and push us trough our core and we went sprawling to the floor. Stunned and exhausted, we lay on the floor for a while, struggling with the implications of our experience. “All ok, boys?”, boomed Sensei’s voice. I turned to look at him, as he towered over us, with a smile adorning his face and not a bead of sweat could I catch glistening on his temples. Sensei’s ki had truly made its point. After a week or two from then, Sensei moved to Dehradun. He taught Aikido to some of the schools on the Doon-Mussourie circuit. He even stared a career as a performing ghazal singer and I lost touch with Aikido and him. I missed the camaraderie of the classes and the joy of learning an art from an exceptional teacher and expressing myself through it. The strength and compassion that Aikido demanded was making me into a better person and I missed the person I was beginning to become. But most of all I missed that touch of the near divine – the pursuit of ki. Join an open e-mail discussion group Aikido in India. The purpose of this group is to provide the Aikido practitioners and Aikido fans in India a platform to discuss related to Aikido topics, to announce forthcoming events, to exchange ideas and to unite our efforts in order to popularize this unique Japanese martial art in India. All are welcome! This service is free and easy to join. Just follow the link and the instructions. This mail group is an initiative of the New Delhi Aikido Dojo. To facilitate communications among our members, we have created a private email list. All active members are strongly encouraged to subscribe to this email list. In addition to the email announcements about seminars and special events, this email list provides up-to-date/last minute information on schedule changes, important information relating to dojo operation, and an occasional email about non-aikido events a dojo member is personally involved with. Please note that not being a member of the email list will preclude you from receiving potentially important email announcements from the dojo management. Also, it is the responsibility of individual members to update their contact information. What is the Literal Meaning of Aikido? force” or “spirit.” Do, the third character in the word, means “Path” or “Way”. Thus Aikido can be translated as “the way of unity with the fundamental force of the universe”. Aikido is a true Budo, or a “Martial Way.” It has evolved in the historic tradition of Japanese warrior arts. Since Aikido’s movements and techniques arise from the most efficient utilization of the entire person, the practitioner, regardless of physical strength, can develop great power. Instead of an emphasis on punches or kicks against opponents, Aikido uses the energy of their attacks to throw or gain control of them. Rather than being a static martial art, there is a great emphasis on circular movement around a stable, dynamic center. Aikido is a unique, contemporary Japanese martial art. While it is an effective form of self-defense, based on decades of applied technical research and practice, Aikido can also nurture the inner strength and spiritual side of an individual-the body, mind and spirit. Practice encompasses a broad range of training styles, and allows people to train based on their individual stage of development. People from all walks of life practice Aikido: men, women, the elderly, children, business people, students, athletes, professional dancers, and practitioners of other martial arts. Even physically handicapped people have practiced Aikido and benefited from it. the early twentieth century, by synthesizing and transforming several traditional Japanese fighting arts. 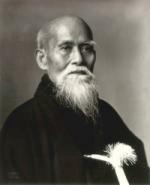 From an early age, Morihei Ueshiba, known to millions of Aikido practitioners as O-Sensei (or Great Teacher), was an extraordinary martial artist, a master of the sword, staff and Ju-Jitsu. Yet O-Sensei was a deeply spiritual man, and troubled by the futility of a path based solely on victory over others. He desired a system that could enrich and empower individuals in their daily life, where a person could ultimately achieve success through a development of power, calmness, and confidence. O-Sensei’s Aikido came from this spiritual desire to promote peace in society, through the development of harmony in thought, word and action. Because of O-Sensei’s teachings and the efforts of many dedicated teachers and students, Aikido has become increasingly popular in many other parts of the world outside of Japan. Today it is practiced in places like the United States, South America, Europe, South-East Asia and Russia. practice stretches the body, improves circulation and helps to coordinate one’s breathing with balanced, harmonious movement. Aikido practice and the meditative space of the Dojo can help to decrease and transform our day-to-day and nervous stresses. Furthermore, by stimulating both physical and mental faculties, Aikido encourages harmony in the whole being. It helps us manifest both our inner and outer beauty. 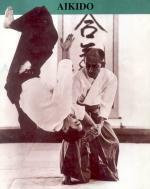 Aikido training works on many levels of each practitioner. Careful training with a partner allows one to train without injuries – it is a style of training that easily adapts to the needs of each person. This combination of physical and intellectual exercise benefits all, regardless of age, gender, race, or religion. Traditional Asian medicine often promotes a “hands-on” approach to healing. So while the locks and pins in Aikido are designed to immobilize an opponent, they also stimulate the joints and serve as a vigorous form of massage. Aikido is a healing art. Perhaps its greatest value is as a system that promotes good physical and mental health. We all, at some point, must face up to illness, aging, death and the loss of loved ones. While Aikido practice does not guarantee freedom from physical and psychological ailments, it can help us accept the challenge, root out its source, work with it, and not accept defeat. Aikido is medicine for a sick world. O-Sensei, Morihei Ueshiba – the founder of Aikido – once wrote that evil and disorder exist in the world because people have forgotten that all things emanate from one source. To cure the world of this sickness, he felt that we needed to return to that source and leave behind all self-centered thoughts, pretty desires, and anger – this is what he considered the path of aiki. As a result, in Aikido there are no competitions. There is no need for achievement based on artificial standards. Each trains according to their capability. The struggle is ultimately with oneself, on one’s own path of Aikido.